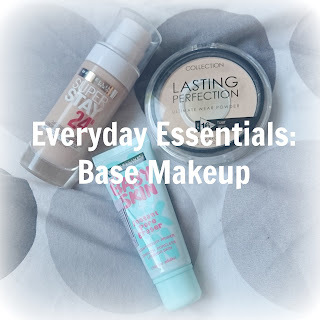 TheDarkeowl: Everyday Essentials: Base Makeup Essentials! I usually start off with my Maybelline Baby Skin Instant Pore Eraser Primer to ensure that my skin is ready for makeup and that it will last throughout the day. I like this product quite a lot. It's lightweight and smooths out my skin. My pores are quite visible around my nose area so this helps smooth them out and even out my skin. It makes my skin feel very silky too which I like. I can't compare this to any other primer, because it's the only one I've used, but it does help my makeup last longer and I think I will try another primer (or the same one) when this has run out! Next step in my everyday makeup is my foundation! The past 2 bottles of foundation I have bought have been Maybelline's Super Stay 24 Hour foundation. I absolutely love this foundation! 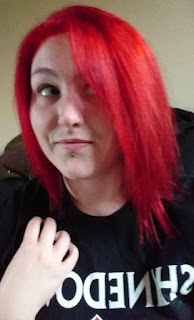 It's really lightweight but still offers great coverage. It doesn't cake your face in makeup and the colour matches my skin well. It's buildable too, so if you need a bit more coverage then you can layer it quite well, although the first layer (for me) does offer great coverage anyway. Even though it gives good coverage, your skin can still breath and it does allow some natural colour to show through. Throughout the day it lasts well, I sometimes have pretty oily skin and the oil usually only shows around the end of the day so lasting power is good too. This foundation also contains SPF (19) so helps to protect your skin against the sun! There is no scent to the SPF and the overall smell of the foundation is quite nice, yet not overpowering. I will keep on using this foundation, I think it's the best one I've found in a long time, the consistency is good, it's a good price and it works well on my skin. I am tempted to try Maybelline's 'Better Skin' foundation too so I may try that when this one runs out; but I definitely recommend this foundation for everyday use! The last thing I use for my base makeup is Collection's Lasting Perfection pressed powder. Many people rave about Collection's lasting Perfection concealer, but I haven't had the chance to try it yet. But if the powder is anything to go by then I can see why! I can honestly say that this is the best powder I have ever used! It's very fine and doesn't leave a cakey look. It sets my foundation amazingly and gives my face such a smooth finish, you can hardly tell that there is any powder there! If you run your finger across the pan you feel how soft it is and it does build up a bit of colour coverage. It's pretty matte and in my opinion it can be applied with either a brush or the little sponge that it comes with. I've found that the sponge does set it slightly more and gives a more flawless look but does also build up a bit more colour, whereas a brush doesn't leave as much product on your face. Both methods are good depending on the look you are trying to achieve! It's a very reasonable price too, averaging around £4 at Superdrug. I've very nearly finished this powder and I'm pretty sure I will be buying this again, I've enjoyed using this product and I trust that Collection can deliver on performance again! So those were the products that I use on a daily basis, I'm a simple girl and don't use much as my base makeup. I would recommend all of these products. If you have any recommendations please let me know, or if you have used these products before let me know your experience!